The perfect treat for your littlest, this Comfy-N-Secure Coaster Swing seat is a must-have for families with a toddler in tow. This handy swing is designed for children ages 18 months to 3 years, made from durable plastic with a high seat back for ultimate comfort. For your convenience, this swing is easily compatible with almost any swing set, so you can attach your new Comfy-N-Secure model without any fuss. You get a cushioned, 3-point T-Bar and lap belt for a secure swing experience, and water and mold-repellent padding that’s quickly removable for easy wash. Your new swing features a 55 lb. weight limit – the perfect size for your kiddo. 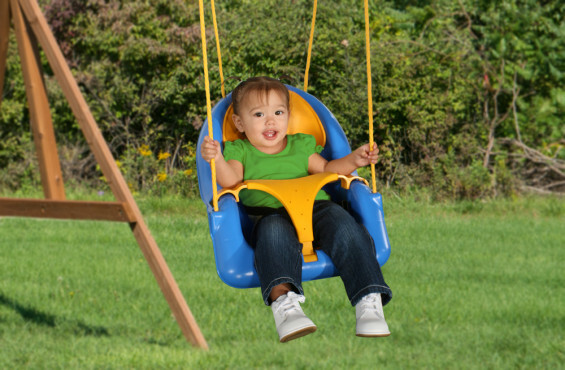 Get your Comfy-N-Secure Coaster Swing for toddlers today, and give your youngster a truly happy, healthy childhood. Assembled Dimensions: 16-3/16" W x 50" L est. Weight with Packaging: 4.75 lbs.